I was prescribed 500 mg/day of Levaquine for both a UTI and Upper Respiratory infection in November of 2007. By the 3rd day of taking the prescription I was in bed with terrible nausea and a severe headache (both common side effects of Levaquine). I phoned the doctor and he had me stop the Levaquine and I believe I was switched to a Z-pack. Since that time, I have had periodic pain in the upper front of my hip. It usually follows moderate exercise, such as playing tennis. It has been getting a little better, but after reading your conversation David T. Fuller, I'm concerned that I may be just at the beginning of a lifelong problem that will just get worse. Has it been confirmed that Levaquine-related tendon injuries do degrade the tendon over time, or cause a permanent change in DNA? Does a person with this Levaquine-induced condition have to just greatly reduce or minimize physical activity to avoid the condition worsening? And have Levaquine users found success with the beef broth, magnesium and ice? So either you have a non-Levaquin related tendon/muscle Pain Causing Dynamic that just happened to show up coincidentally, (regular tendonitis issues usually progress and get worse, nothing surprising there), or you have Levaquin Tendonitis that just happened to for some unknown reason show up at the front of your hip. The rest of this is responding to the Levaquin side of things. From what I've seen, it's not that floroquinolone cytotoxicity damages tendon over time, it's that the one time influx of toxicity and the body's response/interaction with it does some kind of long term, lasting damage. Science doesn't seem to agree on why exactly that is. DNA damage has been found, and it's probably the best theory for why tendon and other connective tissue doesn't heal very well. Something in the healing is flawed. In other words, there's no 'for sure' answer as to the cause yet. Does a person with this Levaquine-induced condition have to just greatly reduce or minimize physical activity to avoid the condition worsening? And, it depends on your exact situation. Some people shred their tendons just by standing up out of a chair. Some people just have pain and have to moderate their mobility, or learn to push it just right. It depends on how 'fragile' your structure is. And have Levaquine users found success with the beef broth, magnesium and ice? Honestly, I haven't heard back. Ice will reduce pain and get new blood and nutrition to damaged areas, if you do it enough (it's a learning process). But it's not a cure and won't reverse the problem. Magnesium -should- help with muscle tightness and pain and help a person sleep, if one takes enough to get one's levels up. And while Magnesium bonds to the Levaquin and prevent it from working, it looks like all active aspects of Levaquin are out of the body in three days. Still, were it me I'd get my Magnesium levels up anyway, because it's healthy for you and on the off chance it will bind any still active ingredients lurking and causing problems. The Bone Broth is full of nutrients your tendons and body need. Flooding your body with good nutrients can't hurt and can only help. The problem with Levaquin Tendonitis is that A. Nobody knows and B. Everybody's reaction and interaction with Levaquin is different. Some are worse off than others. But there are common (unknown at this point) elements. These common elements will, I predict, eventually be found and explain why some people get damage and different amounts of it, and some don't. I have a page of suggestions for overall support that are worth trying. And, for targeted assessment of various markers in the body and how your body is working (detoxifying, creating cell energy, etc) I hope people will get the test. I believe that it's worth it. My husband was severely damaged by Ciprofloxacin. he had tendonitis in both shoulders, and upper arms, a torn rotator cuff, pain in his knees and also got the pain in his eyes along with snowy floaters. He had been on 500 mg. twice a day for a month at a time. Supposedly for a prostate infection. Over a period of 3 years or so, he had this given to him 3 times for a month each time...That is about 120,000 mg. of Cipro at 30,000 mg. per mo. He had to give up golf, bowling, and work. He thought this was going to be his fate till he died. The pain was awful, he could barely get out of bed, because it hurt his arms so badly. We followed your protocol, it took a while, but he is back to pretty much normal...His eyes took a while, they put him on Pred Forte, but it kept coming right back..They said it was Iritis, but it came at the same time as the tendonitis. He stayed on a preventative dose for a while and it finally cleared up. We wish everyone with this antibiotic poisoning, would learn about your site and follow your protocol...the doctors of course, for the most part do not believe that their prescription had anything to do with something that he just woke up one day with and got worse over time, till he started the protocol. He didn't injure himself, he was damaged at the cellular level by these antibiotics. THANK YOU to you and Kerri!!!!! I'm glad that surgeon listened to you and used his common sense to say 'no'. Instead of forging onward out of habit and hubris. We need more doctors like that, willing to listen and educate themselves (and use their common sense). So that's great Karen, that your husband has done the work necessary to give his body a greater and faster chance to recover. The cytoxic effects and ramifications of Levaquin, Cipro, Levofloxacin, Avelox, etc can be reversed and healed. Obviously, the worse a person has been affected, the more time and attention is required for the body to do what needs to be done. I hope more people find out about us too. I see too many people on forums etc complaining that their doctors are no help and nothing they've tried so far has helped. Unfortunately, doctors don't know what's going on (and for whatever reason won't look into it), and if a person doesn't try the RIGHT things, there's not much hope of the wrong things helping much if at all. Feel free to share a link to this page or the name of the site when you're out and about on the internet. And THANK YOU for helping your husband find and take action to get his health and life back towards where he wants it to be. That's a great feeling for me, knowing I've helped him get that benefit. Thank you for this page. I had been searching for what to do while healing from a serious infection. I had avoided taking this course of antibiotics unless necessary due to the tendon toxicity because as a ballet dancer and runner with frequently tight calves and ankle problems I fear the inevitable. What can I do now during this antibiotic course to minimize the damage? Are there particular suppliments and stretches? What should I avoid? What can I do once I am back to my regular activities? Why are you taking Levaquin? Do you have any side effects from it at the moment? New tightness, ache, muscle/tendon/ligament pain, anxiety/claustrophobia/mental fog, etc? Pneumonia. Thus far nothing obvious. My ribs hurt presumably from coughing. I'm mostly interested in recovering safely from my illness but not incur career-ending injury. You may want to talk with your doctor and switch to a different antibiotic. Pneumonia is not good news, but the side effects of Levaquin can end your career if you get side effects. Levaquin depletes magnesium from the body, thus many of the side effects. I'd tell you to take magnesium to help counter any side effects, but that will also counter the effectiveness of the Levaquin vs. the pneumonia (which I assume the doctors tested to make sure it was bacterial and not viral). So it's either go on Magnesium and off Levaquin, or stay on Levaquin, because there's no sense in taking Levaquin if you're simultaneously taking Magnesium. (Test your doctor to see if s/he knows that). Took levaquin for pnuemonia im 58yrs old 50 mile per week runner first run after meds severe calf and achille pain. Tips and tricks and suggestions just aren't going to do it for a Levaquin issue. ESPECIALLY if you want to get back to running. My recommendation is to learn as much as you can about Levaquin and it's affects on the body. Or at least, learn what you need to know to give yourself the best opportunity to recover (as you'll learn in The Levaquin Tendonitis Solution). Until your body repletes the nutritional depletion caused by Levaquin, avoiding running is probably a smart thing to do. Give a more detailed description of your symptoms and history of symptoms, and what if anything you've tried for it so far. i have taking 1 pill of levquin out of a 10 day dose i began feeling a weird sensation in my achillies just a little strange i was taught as a kid to listen to my body by my mom so i quit taking anymore and my achillies feel light as if nothing there and when i try to walk i sometimes feel stinging. I am very afraid of permanent damage I'm 24 years old and live in new york i told my doc what i was feeling he said stay off it for 2 to 3 weeks and i should be fine I'm taking new anti biotic so i had to stop my magnesium intake. I had a bit of broth and haven't iced yet its been bout 2 to 3 days since i took it plz i am terrified of achillies rupture. I'm an entertainer and can't afford something like that to happen i would lose everything. plz help thank you for reading. i hope i hear from you i can't explain how terrified i am at the thought of losing my dream. But Levaquin depletes magnesium and that's a huge factor in the mechanism of how levaquin causes side effects. What are you taking antibiotics for? Is it for sure a bacterial issue? Yes i had a uti kidney infection ill be on this antibiotic for bout 6 more days i honestly cried my self to sleep i no that sounds childish but it just feels after all the stories that this feeling of dread will nor go away that at some point in a month or two i will lose my life which is honestly dancing and acting. I don't want to wake up everyday with the fear of it rupturing but no will tell me if it will ever go away if i will be like this for the rest of my life or if i can fix wat has happened all i get are you are young we worry about that in old patients but it doesn't matter when it comes to chemicals they don't discriminate. I can't lose everything plz how do i fix this whatever i have to do ill do it i want to better understand how to fight back. thank you so much for answering by the way and the pain is in my heel everyone in a while like a dull sting. Forgot to say the anti is macro bid he told me magnesium stops the medicine so i should not be taking it i can resume after it is done? Last I heard you're just not supposed to take Magnesium in a 3 hour window after taking the antibiotic. You'll need to make those choices for yourself. Talk to your doctor, educate yourself online, etc. Aside from the overall mental effect and magnesium reduction caused by pain and mental stress, magnesium insufficiency/deficiency side effects include anxiety, fear, depression, etc. You need to make your immune system stronger. There's a reason you A. got a kidney infection and B. your body couldn't beat the kidney infection. Antibiotics aren't a miracle drug, in that they have negative impact on your body, including decrease in the health of your immune function, decreased gut health, etc. You can look into d-mannose for bladder infection (if that's involved). It's a natural and very effective bladder infection 'fixer'. During February 2010 while undergoing BCG treatment for CIS Bladder Cancer under the supervision of a senior urologist at one of the major teaching hospitals in Boston, MA I developed a urinary tract infection. My urologist prescribed Levaquin - a full course of oral 500 mg tablets , one per day for 14 days. All went well until the 12th day when I was suddenly stricken with extreme pain in my left thigh while sitting at my home office desk. I first believed that this was a muscular "charley-horse" and started to attempt to rub it out. Unfortunately, I started to experience the same extreme pain in my right thigh. I tried to get up from my desk chair but fell over onto the floor. By this time the pain had moved to my lower legs, knees and heels and quickly coved my upper body including my spine,chest,neck shoulders and arms. This total virtual paralysis almost caused me to lose consciousness but I was able to grasp the telephone cord and yank it off the desk and was barely able to dial 911 before I passed out. I started my search for a treatment for this supposedly "rare" side effect of Levaquin. Frnakly, I have tried many approaches that I shall not detail in this summary. These include just about every anti inflammatory medication known. Prednisone has offered the most longer term relief, but with a Gleason 7 biopsy for prostate cancer, this is hardly an answer. (Happily, I am now considered cured of CIS Bladder Cancer). Obviously, I am looking for new approaches to dealing with the constant pain and physical restrictions caused by the incurable tendonitis from Levaquin. You didn't leave your email nor check the notification box so I hope you find this (but I'll keep it short until you do). 1. Prednisone is a big no no with fluoroquinolone damage. Your doctor(s) shouldn't have been presribing it to you. 2. Inflammation isn't a problem (particularly) from fluoroquinolones. There's pain etc, but the problem is the huge nutritional depletion fluoroquinolone antibiotics cause. When then leads to a host of other problems. 3. Cramping etc is from magnesium depletion resulting from taking Levaquin. 4. I wouldn't say that levaquin tendonitis is uncurable. Partly because I would never say that, and mostly because it's not true. Like anything else, it's a matter of understanding how the body works, how fluoroquinolones work, and how flouoroquinolones affect the body and how those affects alter the body. I'm on Levaquin for bronchitis. I did not respond to ZPak. 500mg for 7 days. I did not get out of bed for 2 days. Once I took my first dose I felt so much better. I have 4 more doses to go. While I'm having no side effects except my back is sore, neck is sore and a headache from coughing, I'm still concerned with tendinitis/rupture. I take my multi in the morning and my levaquin at night. I'm too weak to exercise, work or teach my classes. I'm drinking tons of water and drinking a lot of chicken broth. Also eating a lot of greens. I haven't been sick like this in YEARS. I lead a very active lifestyle and needed relief. The magnesium depletion is the issue with tendon rupture? I just want to protect myself when I get back into my routine. Is the bronchitis viral or bacterial? Lots of people take Levaquin without any apparent downsides. If you're going to finish your final 4 doses, then pay attention and see how it goes. I know that's not particularly helpful, but there's nothing I can really add other than 'take more magnesium in the morning'. Levaquin depletes magnesium. But (taking) magnesium also stops the beneficial action of the drug. Mag in the morning and Levaquin in the evening is probably fine though, for all the reasons that it would be. I feel like I've been blind sided. And I'm not happy! I'm female age 59. August of 2015 I was treated at an Urgent Care for a UTI. I was prescribed Bactrim until culture came back indicating a change in treatment which led to my taking Levofloxiciin. I'd never heard the term 'fluroquinolones' before and the doctor who perscribed this drug certainly didn't tell me about them. I took Levolfloxicin 500mg for 5 days, 1 daily. After the 5th dose I literally felt like a truck hit me. That fast. Everything that could bend - HURT! I couldn't figure out what was going on. My husband thought 'if he didn't know better' I appeared to be suffering from tendinitis. It didn't make sense to me because I hadn't done anything to warrant even a sore muscle that morning. We looked up tendinitis symptoms, then we looked up side effects of Levofloxicin and Bam! - what a reality. I called the doctor who prescribed it, he said that it appeared I was experiencing acute tendinitis due to the Levofloxicin and to discontinue and start a new prescription which was Cipro. He assured me the tendinitis was only temporary and that I would be feeling better soon. I believed him. It's over a year later and I've had (what I describe as) tendinitis 'flare ups'. Wrists, fingers, ankles and various other areas hurt during these flare ups. Flare ups seem to hit with no warning. They just arrive. They come and the go. About 3 months ago my left foot started doing this popping and cracking, didn't seem to hurt, it was just 'odd'. Then a popping and cracking that left my foot in pain. The pain, over the last month has grown worse. My foot hurts in areas to the touch and I feel at times I'm walking on a raw nerve on the outside part of my foot where the baby toe joint is. After deep reading on the anatomy of the foot, I believe what I've been experiencing is the tendon in my foot tearing. I've been to my doctor and she was of no help. All she said was that I would find it difficult to prove that this was caused by the drug. She sent me to a podiatrist and he said it looked to be capsulitis and he wanted to put me on a steroid for 2 months. And then possibly a series of 3 steroidal shots. I said NO. And here I am. In pain. Swollen foot, very painful and an aching leg. Tendinitis flare ups elsewhere as well. And I'm very upset. I'm flabergasted that your doctor told you to stop the Levofloxacin because it was hurting you and switched you to Cipro....which is basically the same thing. They are both fluoroquinolone antibiotics with the same action/mechanism, and cause the same side effects. Sorry to hear that you're in pain, etc. There's nothing nice to say about that, and I wouldn't be happy either. And good news/bad news, all there is to do at this point is to try to reverse the effects the fluoroquinolones had on your body/function. That you're suffering symptoms a year later points to that your body needs help recovering. Leaving this here so Fred definitely gets notice of reply. Hey I was prescribed levaquin in October around Halloween for a sinus infection I was supposed to take it for 10 days however I stopped 5 days in because of the side effects I felt (cramps spasms ,tendon issues). Not to mention that within a month I lost most of my muscle mass im a professional football player and this had potential ruined my career. It feels like my muscles or tendons want to rip every time I make a fast quick movement no doctor is cooperating they say it's very very rare but that's bs the stuff messed me up. Doctors brush me off like I'm crazy and it's not from the meds but it's definitely is I have an cfl tryout next month that as of right now looks like I won't be ready for. The tendinitis is crazy I feel it in my hamstrings areas where tendons are in my quad a little buy the ankle/calf area and the tendon the connects my shoulder to chest like under armpit all most it's making me want to give up on life it's been two months help what can I do it's ruined my life right now will a cortisone shot work? 1. NOOOOO. No corticosteroid injection. Corticosteroids and Fluoroquinolone antibiotics are a bad idea. 2. Unfortunately, doctors are clueless about fluoroquinolone side effects...and seem to have no interest in doing ten minutes of research. I imagine they don't want to admit to themselves or others that A. this antibiotic they prescribe like candy harms people, B. that they hurt somebody with their prescription, and C. that they have no idea how to fix it. How can I help? 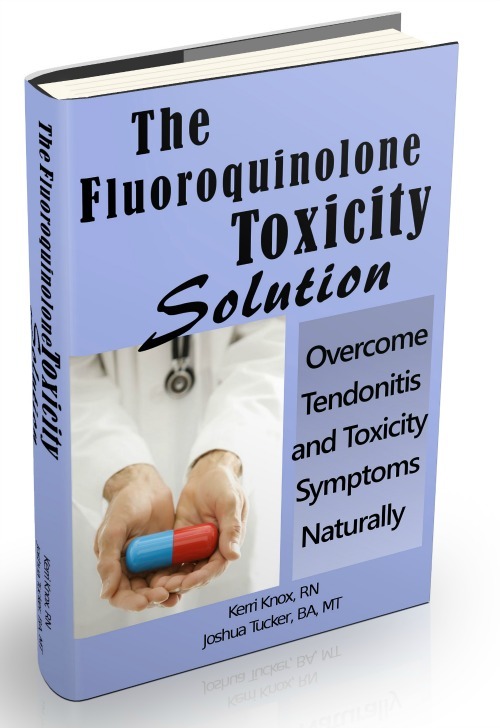 Get The Fluoroquinolone Toxicity Solution (formerly The Levaquin Tendonitis Solution) and make a thread for yourself on the Forum Kerri and I run for people working with the program. Levaquin does 1, 2, or 3 of the following three things. Hopefully you're just in the '1' category. 1. Massive nutritional insufficiency. Like, if you're a car, you suddenly were stripped of 90% of your gasoline, oil, transmission fluid, and radiator fluid. You can imagine that you're not going to run very well in that scenario. All the pain and tightness, etc, can be just from that. And there's no getting better (not anytime soon) unless you replace that nutrition. 2. Kill off of the mitochondria in connective tissue. Mitochondria are the power plants of your cells. To repopulate you have to take care of #1, and then nutritionally bolster the mitochondrial process so they can repopulate. 3. Actual DNA damage to connective tissue. To fix this is #1 and #2 and a fair amount of time. Most people just have #1, or #1 and some amount of #2. The important thing for you right now is to get out of the hole that Levaquin put you in. Your scenario is distinctly different than, say, stepping on a nail or taking a big hit and breaking a rib. Those heal naturally with time. Levaquin side effects don't heal with time, they ONLY heal with getting nutrition etc back into your body so your body can start to return to normal function, and some time for that to happen. Get the program and start working it, get in the Forum and we'll make sure you're doing what you need to be doing, monitor your progress, etc. I am 65 years old over the last year and a half I have had a torn Achilles tendon, woke up one day and all the tendons in my left hip were partially torn, 3 mos later I fell backwards. Almost flipping over and tore my right rotator cuff. Six weeks later I tripped over my dogs bed falling flat on my side down on my elbow. fractured elbow and severely tearing the right rotator cuff . after the fall I begin to limp and had pain in my left hip again now in April 2018 I had an MRI of my left hip which showed a full thickness tear of the gluteus mediaus tendon and a partial tear of the gluteus minimus tendon. I asked an orthopedic doctor if it possibly could’ve been from the Levaquin he said all we only see Achilles tendon tears. He injected my hip saying oh you have bursitis then he finally ordered this 2nd MRI and he’s referred me to another doctor if they repair this thickness tear will it tear again? Is there a test to see if it’s from the Levaquin ? 1. There is no test. 2. That your doctor has only ever seen torn achilles from Levaquin (wow, he admitted that Levaquin can cause achilles tendon ruptures?? That's rare) in no way means that that's the only tendon/connective tissue that Levaquin can damage. 3. It sounds like he was just pulling a wild guess from his back pocket when he diagnosed you with bursitis. 4. I do not know what will result from a surgery to reconnect the ruptured hip tendon(s). It will either hold, or it won't go very well. My story begins 13 years ago when I was bit by a brown recluse. Developed into a gram B infection followed by 13 surgeries. These took place over several years, with levaquin or cipro prescribed. "Coincidently" between these corrective surgeries I developed tendinitis, trigger fingers in both hands popped tendon in one hand. He often treated me with cortisone shots prior to surgeries to see if it would remove the need for surgery. Every surgery was pre empted w cortisone shot, surgeries followed by L or C. Then another tendonitis, i think 18 surgeries or more. Each causing the next tendititis. Insanity. Years later, both feet hurt to walk on, both elbows so weak I cant open the sliding door, 3 tears to my rotator cuff and hips that feel like I'm 89 years old. I am 58. One of 10 children to same parents, not one of us has had any tissue, ligament or bone issues. My parents went to see Jesus at 102 yrs and 94 years. We are all good healthy stock, raised with nutrition, no junk. Then the L and C.
My doctor wants to do surgery on r elbow, said its a tear. But first he shot me w cortisone and it has not recovered just from the shot. I feel like I am shrinking. Normally quite physically active, i find it difficult to sit on a chair now. In spite of the years between L and C (5yrs) I know they are the cause of my issues. I am terrified of these tendons popping, now timid to even stretch. Please suggest something to bring life back to my body. All I can suggest, and the only thing worth suggesting, is that you get and start working with The Fluoroquinolone Toxicity Solution program (and the forums we run for people working with the program). Or said another way, suggestions aren't going to help. The complete plan of attack and support that the program provides can/will help.